Create professional-quality flyers and other marketing materials using this glossy brochure paper. The eye-catching sheets help ensure that clients have a great introduction to the services and products that you can provide for them. 48-lb heavyweight HP inkjet printer paper features high-performance coating on both sides for 2-sided printing. 98-bright surface displays stunning, vibrant images. Pack of 150 printer paper sheets helps keep your office fully supplied. Produce image-intensive brochures and flyers that rival professional print shops in cost and quality, without leaving the office. HP Glossy Brochure Paper features a bright-white finish and glossy coating—for crisp text and vivid colors—on HP inkjet printers. A substantial weight gives marketing materials a professional feel, while high opacity ensures minimal show-through when printing on both sides. Print on both sides of the page, using thicker paper designed for minimal show-through. 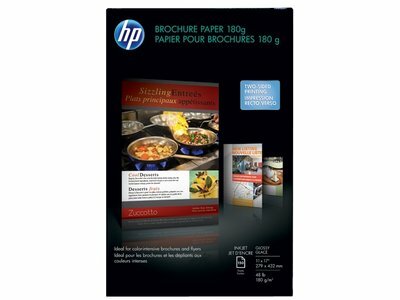 HP Glossy Brochure Paper enables easy, timely and inexpensive customization of marketing materials and on-demand print jobs. The commercial-quality weight gives business collateral a standout appearance. Print crisp text and vivid colors—on both sides of the page—using paper with a smooth, glossy coating. Images printed on HP Glossy Brochure Paper produce colors that are rich and deep, for eye-catching results. Count on hassle-free printing, using paper optimized for smooth paper feeding. Save time and money when you choose a reliable paper that makes on-demand printing easy.